to serve nearly every possible application. Automotive use links are self-acting break appliances for the protection of electrical devices against unsuitable current loads. The current flow is interrupted by the melting of the fuse wire in which the current flows. The rated voltage (UN) of a fuse link has to be at least equal or higher than the operating voltage of the device or assembly unit which is to be protected with the fuse link. If the operating voltage is very low, the fuse link's natural resistance (voltage drop) must possibly be taken into consideration. The voltage drop (UN) is measured according to standards e.g. DIN, ISO, JASO, partially maximum values common for Littelfuse are stated as well. The rated current (Irat) of a fuse link should approximately correspond to the operating current of the device or assembly unit which is to be protected (in accordance with the ambient temperature and rated current-definition, which means the permitted continuous currents). Due to different specifications of rated current the recommended continuous current of the fuse links is max. 80% of their rated current (with an ambient temperature of 23°C), see also the fuse-specific current-carrying capacity (F) on the individual pages of the catalog. The melting integral (I2t) results from the squared melting current and the corresponding melting time. At excess current with melting times < 5 ms the melting integral remains constant. The data in this catalog are based on 6 or 10 x lrat. The melting integral is an index for the time-current characteristic and informs about the pulse consistency of a fuse link. The mentioned melting integrals are typical values. The breaking capacity (IB) should be sufficient for any operating and error conditions. The short-circuit current (maximum fault current) to be interrupted by the fuse links at the rated voltage under default conditions must not be higher than the current corresponding to the breaking capacity of the fuse link. The maximum power dissipation (PV) is determined at a load with rated current, after having obtained temperature equilibrum. In operation, these values can occur for some time. 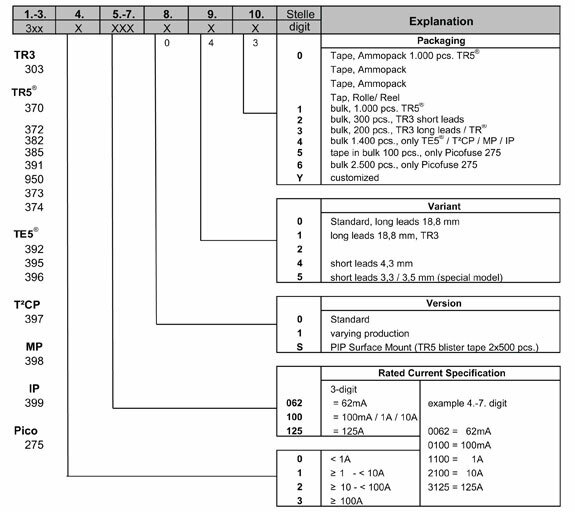 Typical values are indicated and in addition the standard values for fuses that comply with standards. "Any person involved in the production of electrical systems or the manufacturing of electrical equipment, included those dealing with the operation of such systems or equipment is, according to the present interpretation of the law individually responsible for every aspect of compliance to the recognized rules and procedures of electrical engineering." 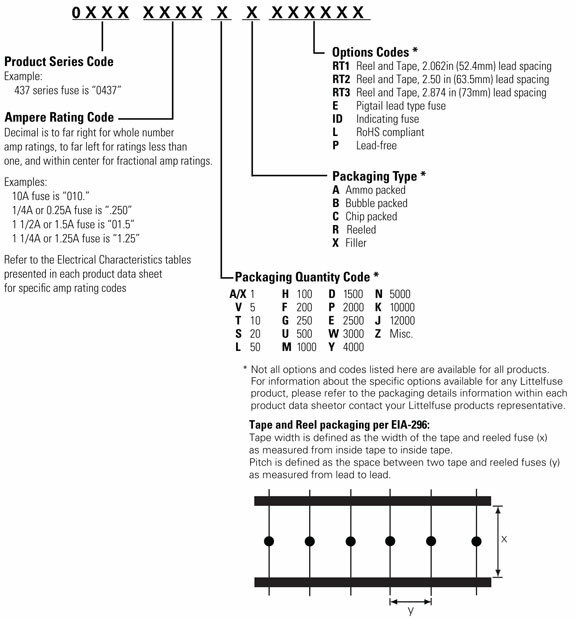 The necessary voltage rating of a fuse link is established by its required operating voltage (taking into consideration the voltage drop of the fuse link). The above mentioned two points will help you to ascertain the most suitable current rating of a fuse link and its pre-arcing time limits (if necessary verify experimentally). The necessary breaking capacity of the fuse link is determined by the max. possible fault current which can occur. In addition to the above-mentioned points, the method of installation is also important for correct fuse link selection (taking into consideration possible approvals). With regard to specific conditions of any particular application (product-safety) it is generally necessary to check the fuse link and/or the thermal circuit breaker or holder in the device which is to be protected under normal and fault conditions! Refers to the temperature of the air immediately surrounding the fuse and is not to be confused with “room temperature.” The fuse ambient temperature is appreciably higher in many cases, because it is enclosed (as in a panel mount fuseholder) or mounted near other heat producing components, such as resistors, transformers, etc. Also known as interrupting rating or short circuit rating, this is the maximum approved current which the fuse can safely break at rated voltage. Please refer to the interrupting rating definition of this section for additional information. The nominal amperage value of the fuse. It is established by the manufacturer as a value of current which the fuse can carry, based on a controlled set of test conditions (See RERATING). Catalog Fuse part numbers include series identification and amperage ratings. Refer to the FUSE SELECTION GUIDE section for guidance on making the proper choice. For 25ºC ambient temperatures, it is recommended that fuses be operated at no more than 75% of the nominal current rating established using the controlled test conditions. These test conditions are part of UL/CSA/ANCE (Mexico) 248-14 “Fuses for Supplementary Overcurrent Protection,” whose primary objective is to specify common test standards necessary for the continued control of manufactured items intended for protection against fire, etc. Some common variations of these standards include: fully enclosed fuseholders, high contact resistances, air movement, transient spikes, and changes in connecting cablesize (diameter and length). Fuses are essentially temperature-sensitive devices. Even small variations from the controlled test conditions can greatly affect the predicted life of a fuse when it is loaded to its nominal value, usually expressed as 100% of rating. The circuit design engineer should clearly understand that the purpose of these controlled test conditions is to enable fuse manufacturers to maintain unified performance standards for their products, and he must account for the variable conditions of his application. To compensate for these variables, the circuit design engineer who is designing for trouble-free, long-life fuse protection in his equipment generally loads his fuse not more than 75% of the nominal rating listed by the manufacturer,keeping in mind that overload and short circuit protection must be adequately provided for. The fuses under discussion are temperature-sensitive devices whose ratings have been established in a 25ºC ambient. The fuse temperature generated by the current passing through the fuse increases or decreases with ambient temperature change. 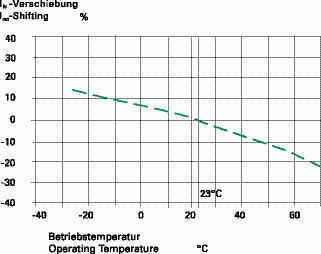 The ambient temperature chart in the FUSE SELECTION GUIDE section illustrates the effect that ambient temperature has on the nominal current rating of a fuse. Most traditional Slo-Blo® Fuse designs use lower melting temperature materials and are, therefore, more sensitive to ambient temperature changes. Unless otherwise specified, dimensions are in inches. The fuses in this catalog range in size from the approx. 0402 chip size (.041”L x .020”W x .012”H) up to the 5 AG, also commonly known as a”MIDGET” fuse (13/32” Dia. x 11/2” Length). As new products were developed throughout the years, fuse sizes evolved to fill the various electrical circuit protection needs. The first fuses were simple, open-wire devices, followed in the 1890’s by Edison’s enclosure of thin wire in a lamp base to make the first plug fuse. By 1904, Underwriters Laboratories had established size and rating specifications to meet safety standards. The renewable type fuses and automotive fuses appeared in 1914, and in 1927 Littelfuse started making very low amperage fuses for the budding electronics industry. The fuse sizes in following chart began with the early “Automobile Glass” fuses, thus the term “AG”. The numbers were applied chronologically as different manufacturers started making a new size: “3AG,” for example, was the third size placed on the market. Other non-glass fuse sizes and constructions were determined by functional requirements, but they still retained the length or diameter dimensions of the glass fuses. Their designation was modified to AB in place of AG, indicating that the outer tube was constructed from Bakelite, fibre, ceramic, or a similar material other than glass. The largest size fuse shown in the chart is the 5AG, or “MIDGET,” a name adopted from its use by the electrical industry and the National Electrical Code range which normally recognizes fuses of 9/16” x 2” as the smallest standard fuse in use. An important part of developing quality overcurrent protection is an understanding of system needs and overcurrent protective device fundamentals. This section discusses these topics with special attention to the application of fuses. If you have additional questions, call our Technical Support and Engineering Services Group at 1-800-TEC-FUSE (1-800-832-3873). All electrical systems eventually experience overcurrents. Unless removed in time, even moderate overcurrents quickly overheat system components, damaging insulation, conductors, and equipment. Large overcurrents may melt conductors and vaporize insulation. Very high currents produce magnetic forces that bend and twist bus bars. These high currents can pull cables from their terminals and crack insulators and spacers. Too frequently, fires, explosions, poisonous fumes and panic accompany uncontrolled overcurrents. This not only damages electrical systems and equipment, but may cause injury or death to personnel nearby. To reduce these hazards, the National Electrical Code® (NEC®), OSHA regulations, and other applicable design and installation standards require overcurrent protection that will disconnect overloaded or faulted equipment. Industry and governmental organizations have developed performance standards for overcurrent devices and testing procedures that show compliance with the standards and with the NEC. These organizations include: the American National Standards Institute (ANSI), National Electrical Manufacturers Association (NEMA), and the National Fire Protection Association (NFPA), all of which work in conjunction with Nationally Recognized Testing Laboratories (NRTL) such as Underwriters Laboratories (UL). Electrical systems must meet applicable code requirements including those for overcurrent protection before electric utilities are allowed to provide electric power to a facility. 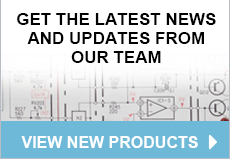 What is Quality Overcurrent Protection? Meets all legal requirements, such as NEC, OSHA, local codes, etc. Provides maximum safety for personnel, exceeding minimum code requirements as necessary. Minimizes overcurrent damage to property, equipment, and electrical systems. Provides coordinated protection. Only the protective device immediately on the line side of an overcurrent opens to protect the system and minimize unnecessary downtime. Is cost effective while providing reserve interrupting capacity for future growth. Consists of equipment and components not subject to obsolescence and requiring only minimum maintenance that can be performed by regular maintenance personnel using readily available tools and equipment. An overcurrent is any current that exceeds the ampere rating of conductors, equipment, or devices under conditions of use. The term "overcurrent" includes both overloads and short-circuits. An overload is an overcurrent confined to normal current paths in which there is no insulation breakdown. Sustained overloads are commonly caused by installing excessive equipment such as additional lighting fixtures or too many motors. Sustained overloads are also caused by overloading mechanical equipment and by equipment breakdown such as failed bearings. If not disconnected within established time limits, sustained overloads eventually overheat circuit components causing thermal damage to insulation and other system components. Overcurrent protective devices must disconnect circuits and equipment experiencing continuous or sustained overloads before overheating occurs. Even moderate insulation overheating can seriously reduce the life of the components and/or equipment involved. For example, motors overloaded by just 15% may experience less than 50% of normal insulation life. Temporary overloads occur frequently. Common causes include temporary equipment overloads such as a machine tool taking too deep of a cut, or simply the starting of an inductive load such as a motor. Since temporary overloads are by definition harmless, overcurrent protective devices should not open or clear the circuit. It is important to realize that fuses selected must have sufficient time-delay to allow motors to start and temporary overloads to subside. However, should the overcurrent continue, fuses must then open before system components are damaged. Littelfuse POWR-PRO® and POWR-GARD® time-delay fuses are designed to meet these types of protective needs. In general, time-delay fuses hold 500% of the rated current for a minimum of ten seconds, yet will still open quickly on higher values of current. Even though government-mandated high-efficiency motors and NEMA Design E motors have much higher locked rotor currents, POWR-PRO® time-delay fuses such as the FLSR_ID, LLSRK_ID, or IDSR series have sufficient time-delay to permit motors to start when the fuses are properly selected in accordance with the NEC®. A short-circuit is an overcurrent flowing outside of its normal path. Types of short-circuits are generally divided into three categories: bolted faults, arcing faults, and ground faults. Each type of short-circuit is defined in the Terms and Definitions section. A short-circuit is caused by an insulation breakdown or faulty connection. During a circuit's normal operation, the connected load determines current. When a short-circuit occurs, the current bypasses the normal load and takes a "shorter path," hence the term ‘short-circuit'. Since there is no load impedance, the only factor limiting current flow is the total distribution system's impedance from the utility's generators to the point of fault. A typical electrical system might have a normal load impedance of 10 ohms. But in a single-phase situation, the same system might have a load impedance of 0.005 ohms or less. In order to compare the two scenarios, it is best to apply Ohm's Law (I = E/R for AC systems). A 480 volt single-phase circuit with the 10 ohm load impedance would draw 48 amperes (480/10 = 48). If the same circuit has a 0.005 ohm system impedance when the load is shorted, the available fault current would increase significantly to 96,000 amperes (480/0.005 = 96,000). As stated, short-circuits are currents that flow outside of their normal path. Regardless of the magnitude of overcurrent, the excessive current must be removed quickly. If not removed promptly, the large currents associated with short-circuits may have three profound effects on an electrical system: heating, magnetic stress, and arcing. Heating occurs in every part of an electrical system when current passes through the system. When overcurrents are large enough, heating is practically instantaneous. The energy in such overcurrents is measured in ampere-squared seconds (I2t). An overcurrent of 10,000 amperes that lasts for 0.01 seconds has an I2t of 1,000,000 A2s. If the current could be reduced from 10,000 amperes to 1,000 amperes for the same period of time, the corresponding I2t would be reduced to 10,000 A2s, or just one percent of the original value. If the current in a conductor increases 10 times, the I2t increases 100 times. A current of only 7,500 amperes can melt a #8 AWG copper wire in 0.1 second. Within eight milliseconds (0.008 seconds or one-half cycle), a current of 6,500 amperes can raise the temperature of #12 AWG THHN thermoplastic insulated copper wire from its operating temperature of 75°C to its maximum short-circuit temperature of 150°C. Any currents larger than this may immediately vaporize organic insulations. Arcs at the point of fault or from mechanical switching such as automatic transfer switches or circuit breakers may ignite the vapors causing violent explosions and electrical flash. Magnetic stress (or force) is a function of the peak current squared. Fault currents of 100,000 amperes can exert forces of more than 7,000 lb. per foot of bus bar. Stresses of this magnitude may damage insulation, pull conductors from terminals, and stress equipment terminals sufficiently such that significant damage occurs. Arcing at the point of fault melts and vaporizes all of the conductors and components involved in the fault. The arcs often burn through raceways and equipment enclosures, showering the area with molten metal that quickly starts fires and/or injures any personnel in the area. Additional short-circuits are often created when vaporized material is deposited on insulators and other surfaces. Sustained arcing-faults vaporize organic insulation, and the vapors may explode or burn. Whether the effects are heating, magnetic stress, and/or arcing, the potential damage to electrical systems can be significant as a result of short-circuits occurring. When available fault currents are less than 100,000 amperes and when equipment does not require the more current-limiting characteristics of UL Class RK1 fuses, FLNR and FLSR_ID Series Class RK5 current-limiting fuses provide superior time-delay and cycling characteristics at a lower cost than RK1 fuses. If available fault currents exceed 100,000 amperes, equipment may need the additional current-limitation capabilities of the LLNRK, LLSRK and LLSRK_ID series Class RK1 fuses. Fast-acting JLLN and JLLS series Class T fuses possess space-saving features that make them especially suitable for protection of molded case circuit breakers, meter banks, and similar limited-space applications. Time-delay JTD_ID and JTD series Class J fuses are used in OEM motor control center applications as well as other MRO motor and transformer applications requiring space-saving IEC Type 2 protection. Class CC and Class CD series fuses are used in control circuits and control panels where space is at a premium. The Littelfuse POWR-PRO CCMR series fuses are best used for protection of small motors, while the Littelfuse KLDR series fuses provide optimal protection for control power transformers and similar devices. For questions about product applications, call our Technical Support Group at 800-TEC-FUSE. For superior protection of most general-purpose and motor circuits, it is recommended to use the POWR-PRO® KLPC series Class L fuses. The Class L fuses are the only time-delay fuse series available in these higher ampere ratings. Information on all the Littelfuse fuse series referenced above can be found on the UL/CSA Fuse Classes and Applications Charts found in the Technical Application Guide at the end of the POWR-GARD products catalog. What is the normal or average current expected? What is the maximum continuous (three hours or more) current expected? What inrush or temporary surge currents can be expected? Are the overcurrent protective devices able to distinguish between expected inrush and surge currents, and open under sustained overloads and fault conditions? What kind of environmental extremes are possible? Dust, humidity, temperature extremes and other factors need to be considered. What is the maximum available fault current the protective device may have to interrupt? Is the overcurrent protective device rated for the system voltage? Will the overcurrent protective device provide the safest and most reliable protection for the specific equipment? Under short-circuit conditions, will the overcurrent protective device minimize the possibility of a fire or explosion? Does the overcurrent protective device meet all the applicable safety standards and installation requirements? Answers to these questions and other criteria will help to determine the type overcurrent protection device to use for optimum safety, reliability and performance.